"I think any kind of hiatus one takes in an artistic journey is going to make a huge difference. The pause will inform the choices that you make." After a three month hiatus I'm back and rejuvenated. A lot has happened since the last post and it has made me a lot stronger than I ever thought I was. I had to leave a job for personal reasons but it was truly for the better. I can now take all the tools they have instilled in me and take the visual display industry by storm. Luckily I was able to start a new job with a brand new company and the change is magnificent. The day after my first day at the company, I lost a very close friend/first love which put me in a very dark and confused place. We were once in a relationship and broke up. However, we had an amazing sit down weeks after we ended our relationship and told each other we would remain friends no matter what. He was also one of the driving forces of my movement and pushed me to do it when I was too scared to put it out there for the world to see. He passed away in August and it crushed me to shreds but deep down I felt content that we made closure. Lastly, by the grace of God, I was able to move out on my own to a chic Apartment downtown Toronto. I never thought that I would be living downtown and now it's a reality. I have the most chilliest landlords ever and the sickest kitchen and living room 😁🙌🏾. There are "three"things that I've learned through these "three" situations during these "three" months. 1) God truly gives u what he knows you can handle and I'm living proof that what doesn't kill you makes you stronger. 2) He rewards you for your hard work and perseravance through the storm. 3) Never hold grudges because no life is promised and u never know when or if you will ever see that person ever again. With all the highs and lows, I had to re-evaluate my business and get out of the "entrepreneur block" that I was in. Also, I had to take a step back from helping others build their confidence and build back my life instead. Heck, what use am I to anyone if I'm not good inside. As 2015 comes to a close, I want to end this year off with a bang and bring in 2016 with even more positive vibes. I want to push my Dyslexia Brand and "Styling The Future You" workshop even more. There is so much more in store so stay tuned. I want to thank everyone near and far for their continuous support. Since I began my project, I've met so many amazing people a long the way and each and everyone of you hold a special place in my heart. I especially want to thank my family and friends who have been my rock and support system through my lows and my highs. Most of all, I want to thank the man upstairs, GOD, who continuously gives me the push and courage to keep going even when I feel like giving up. The road to success isn't easy. No one said it was going to be. But as long as you have faith, determination and a dream, the possibilities are endless! Ace Piva Is Today's Motivational Mckoy Canada Day Spotlight!!! I decided to post this story on Canada Day to acknowledge a really cool Canadian. Ever since I let the world know about me being dyslexic and being a proud advocate for Dyslexia, I've met some of the most extraordinary individuals from all over the world. One of them happens to be right in my backyard. Well, not quite in my back yard but about 45 minutes from where I live. His name is Ace Piva and he is a proud Dyslexic just like me. Ace and I share similar stories, especially when it comes to education and finding out about our "Learning Advantage" during adulthood. Today, Ace's story will be shared with all of you to show that anything is possible with hard work, determination and help from a loved one! Congrats Ace on being the Motivational Mckoy Canada Day Spotlight! "My name is Ace Piva. I’m 36 years old and I was raised in Hamilton, ON Canada. I’m a freelance tour Manager and sound engineer for artists and bands around North America. I’m currently attending McMaster University for Addictions Management. Growing up in school was challenging. Throughout my elementary school years, I had a lot of difficulties with reading and writing. In grade 5 &6, I was put in an ESL class, which I attended twice a week. It was difficult being singled out and I felt alone and misunderstood. I remember taking multiple tests to determine my learning style and never did well on any of them. Weirdly enough, my teachers kept passing me through to the next grade. Unfortunately, the catholic school board refused to hold me back a grade and tried to push information on me in hopes that I would retain information. This was never the case. My parents had many meetings with the school and the school board to get help for me. There was never a conclusion of what my issue truly was. Later down the road, I received special attention for learning but this new found hope brought unwanted special attention from my class mates, which lead to being bullied, name calling and fighting. The fighting continued all through elementary to High School. I failed some of my classes repeatedly and other times I was given passing grades based on me being a nice kid. I rarely did work because I found it very hard to understand and I was scared to ask for help because asking in the past never worked. People never thought that I had Dyslexia because I was very social and great in music and sports. They just assumed that I was lazy when it came to school work. By the end of grade 12, I needed to attend school for another full year plus enrol in summer and night school classes in order to graduate. It was difficult, but I did it. After meeting and talking to someone with Dyslexia in my 20s, it finally dawned on me that I might be Dyslexic. I completed an online Dyslexia testing on my own and was finally diagnosed with Dyslexia when I was 35. Today, I’m attending University and the learning curve has been crazy. I’ve learned to give myself double the time to read, write and complete my assignments. I break down each subject and colour code things to help my thought process. Also, I get a lot of help from my sister, who's been my editor amongst other titles and has guided me through my challenges. No one cares about you more than you! You can’t hide from yourself, so be honest with yourself! If you need help, then go get it! It’s up to you to take the next step to a better future! BE YOU AND BE AMAZING!" Lourdhan Thamo Is This Week's Motivational Mckoy Spotlight! When life gives you lemons, you squeeze the heck out of those lemons, get some oranges, strawberries, wine and make an amazing sangria 😋! My life has been a bit crazy during these last few weeks. Crazy in a good way! But I'm back to business and I'm ready to do what I'm assigned to do! Victoria Noel is This Week's Motivation Mckoy Spotlight! This week I decided to do things a little differently 😉. So different that it had to be on a Tuesday not a Monday. The mission is still to motivate and inspire but also shed light on a topic that is just as important as a Learning Disability. Bashir Afsahi Is This Week's M3 Spotlight! Bashir Afsahi aka " Babi Amari", is a freelance artist specializing in Photography and Design. He currently resides in Toronto, Canada and is enrolled in the Fashion Marketing and Merchandising program at the Toronto Film School formerly known as the Academy of Design. Omololu Abiodun is this week's Motivation Mckoy Monday! Being a track athlete has helped me get through Dyslexia and other challenges in life." 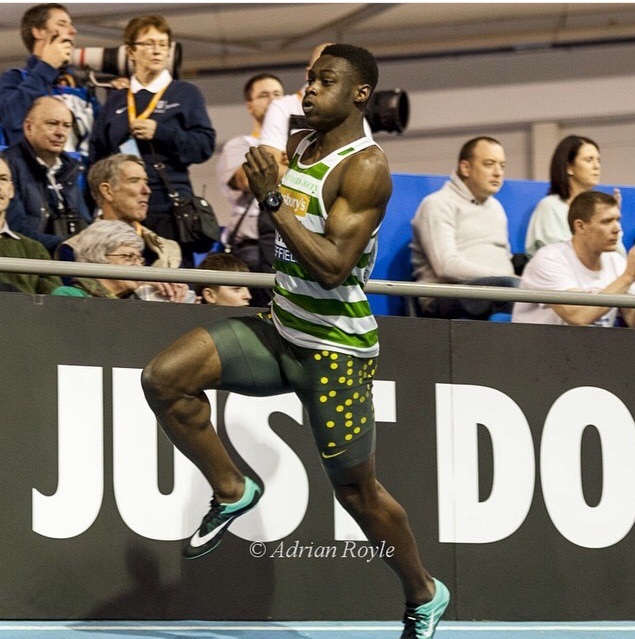 Omololu Abiodun is a 22 year old Sprinter from Britain, with grass roots from Nigeria. He is ranked 4th in the country for the 200m dash. His speed and determination to succeed on and off the track makes him this week's Motivational Mckoy Monday! M3 Spotlight, Shakira Rouse..Creator of Special Compass! Today's and first Motivation Mckoy Monday "M3" Spotlight goes to entrepreneur and learning disabilities advocate, Shakira Rouse! Shakira Rouse is a young professional and student with a passion for languages and education. As if balancing work and books were not enough, she recently added educator, advocate and entrepreneur to her resume. Yes..the post is out a little late..but it's still Monday in Canada and I'm a bit of a perfectionist lol. First off, I want to take the time as always to thank all of you for the comments and amazing support on my movement. Never in a million years would I thought that I would be doing this but I believe that I've truly found my other calling and passion in life. I'm 31 and I couldn't of started any better. I had the opportunity to travel to the UAE to visit my bestie aka my little sister and to celebrate my Birthday. A few years ago, this was just an idea, a dream. To see this project unfold has been one of the best accomplishments of my life.